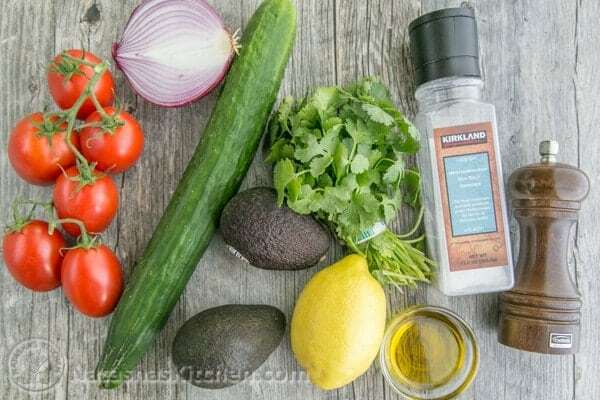 Our family’s favorite classic cucumber and tomato salad just got better with the addition of avocado, a light and flavorful lemon dressing and the freshness of cilantro. 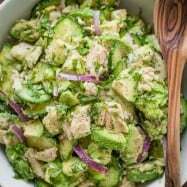 Easy, excellent avocado salad. 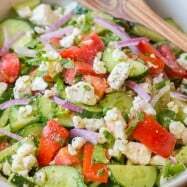 I brought this salad to my parents house yesterday and everyone loved it! This is definitely going into the regular rotation all summer long. Think: homegrown cucumbers and tomatoes :). 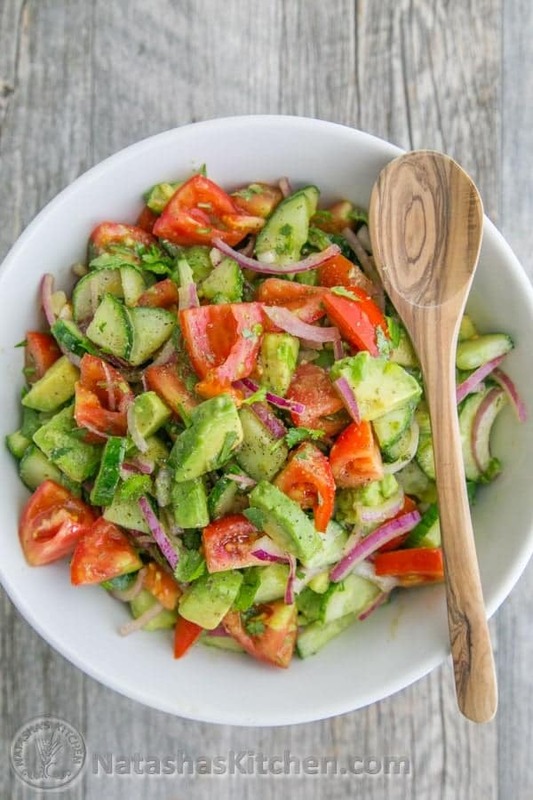 This salad is loaded with veggies; juicy tomatoes, crisp cucumber, creamy avocado and the cilantro and lemon juice make the whole salad so fresh and flavorful! My husband and I ate this entire batch of cucumber tomato salad with avocado in one sitting, paired with roasted red potatoes and grilled shrimp skewers. I shoveled most of the salad into my mouth before I remembered the shrimp and potatoes on my plate; mmming and smiling all the way through. We were both smitten. 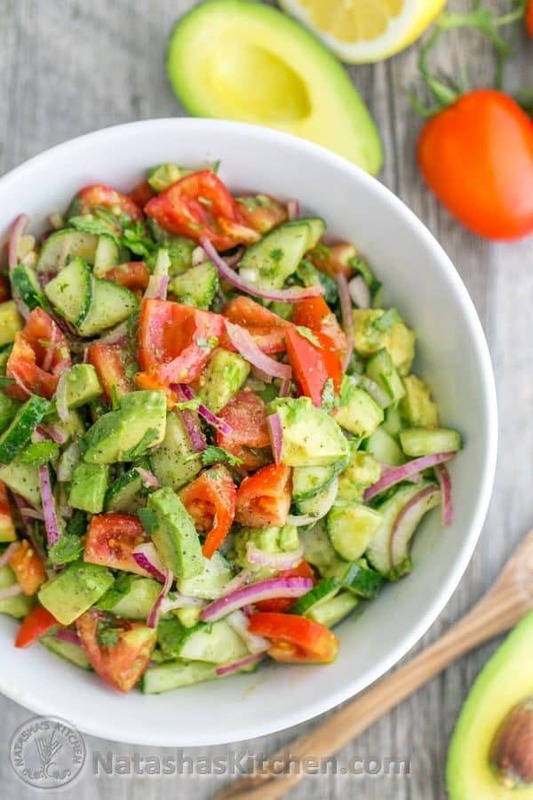 Our classic cucumber and tomato salad just got better with the addition of avocado, a lemon dressing and fresh cilantro. Drizzle with 2 Tbsp olive oil and 2 Tbsp lemon juice. Toss gently to combine. Just before serving, toss with 1 tsp sea salt and 1/8 tsp black pepper. 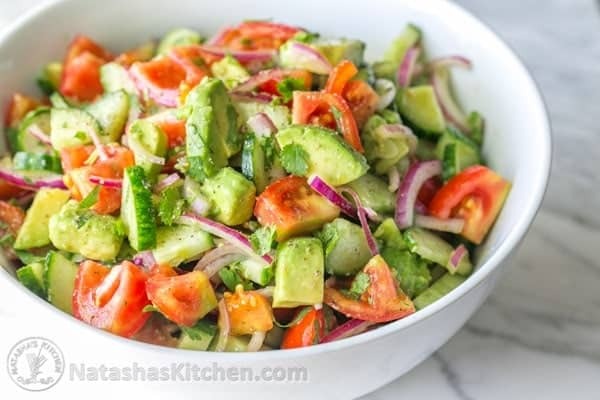 Credits: Recipe inspired by my classic Cucumber tomato salad and this avocado tomato salad from Deborah of Taste & Tell. Visit our Shop to see all the tools we use and love. 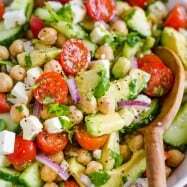 This salad can be made all year long, but it’s especially delicious this time of year when cucumbers and tomatoes are in season. Do you grow any of your own food? and have made it several times everyone rants and raves about it! How long do I cook an 8.26 turkey and what temp? I’m using your recipe with the lemon and parsley. I’ve seen this link from a friend’s post on his wall. This is great! Simple and exquisite. My folks would definitely would love this. My mom keeps asking me any avocado recipes, I can add this to her list since she always make veggie salads every two (2) weeks. 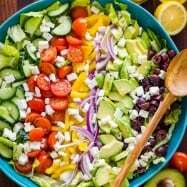 OK love this salad, but now a need to make it for about thirty people can you please help with amounts for the ingredients. 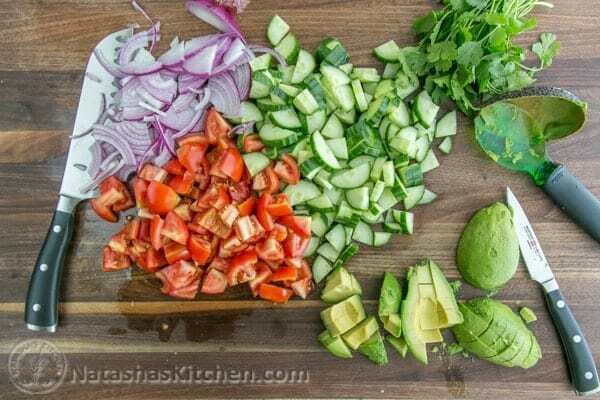 When I made this I made everything but the avocado ahead and dressed and seasoned the salad, and then before serving added the avocado and tossed gently. This was very good. Fresh and tangy – complimented the other dishes perfectly. I have a question. Why did you limit the oil to equal parts with the lemon juice rather than the conventional 3:1 ratio. This worked, but I want to learn the general principle for varying from that ratio. 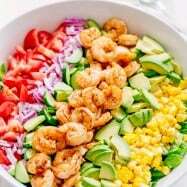 What would you think about adding some amchoor to this recipe? I made this salad for the first time. Loved it! 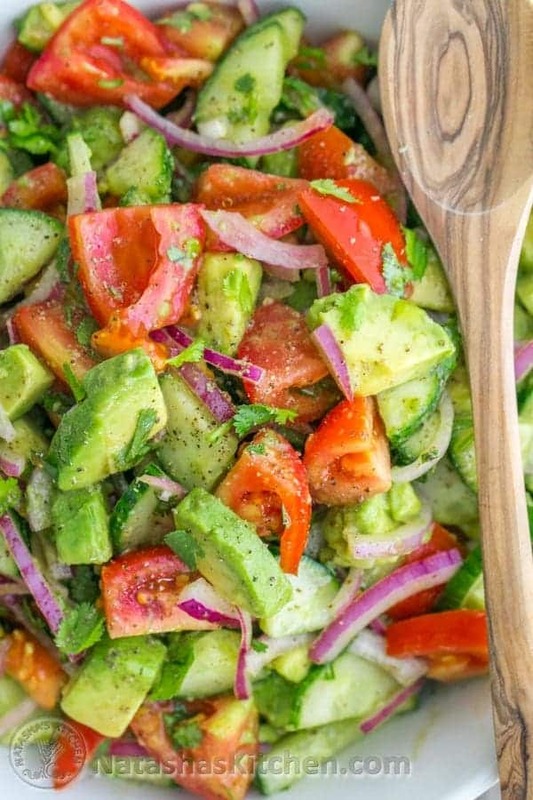 I usually don’t care for Cilantro, but in this salad it is fabulous!!! All the flavours blend together to make it perfect. I halved the recipe- worked out great. Thanks soo much. I shall recommend it. 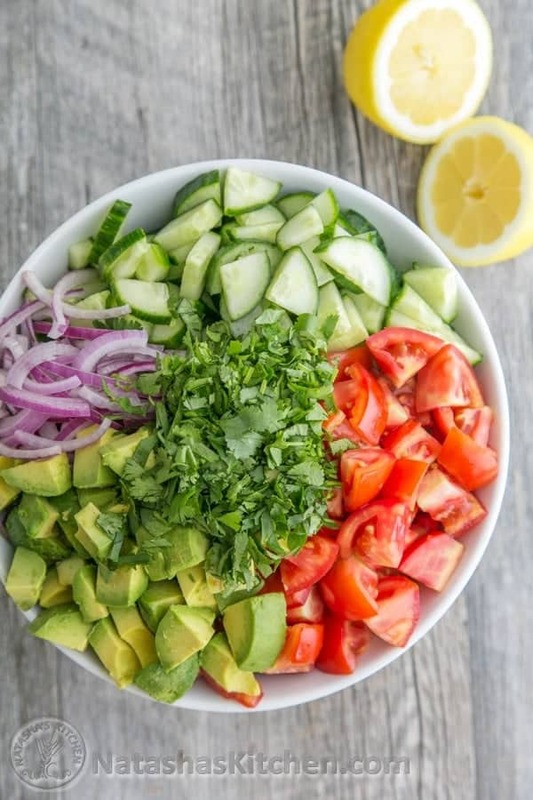 How do you prevent the avocado from turning color? 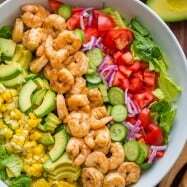 I made this salad for Memorial Day and it was a big hit with my family. My adult daughter kept raving about the flavor (even though she is not a fan of raw onions) and she kept coming back for more. This will definitely be on the menu again. I just stumbled upon a video one day and I was hooked. Thank you for all the wonderful recipes that you provide! Hi LC, you might experiment using a fat free Italian dressing but it wouldn’t quite have the same flavor profile. 1 tsp Dijon & 1tbsp Lemon juice.. So true. cilantro is awful to some, and delicious to others. I MADE THIS FOR FIRST TIME FOR COMPANY. IT WAS TO DIE FOR. FRIENDS AND FAMILY WERE CRAZY ABOUT IT. ALL OF IT WENT.